Each lab lasts one hour and accommodates up to 25 students. Labs cost range between $20 and *$250 per lab (for Dissection Lab*) and include admission to the Museum’s Permanent Exhibit Halls for participating students and their chaperones. Featuring dissections for grades 5–10. Colossal Calamari (September at HMNS and September 28th in Sugar Land) – What animal uses jet propulsion and has its own ink supply? Discover this and more as you delve deep into this intriguing cephalopod, the squid. Includes squid dissection. Raining Ranids (October at HMNS and October 26th in Sugar Land) – A classic example of vertebrate anatomy, the frog still has a few surprises in store. Find out what’s weird about these lean bug-eating machines. Includes frog dissection. 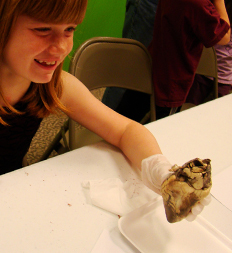 Tugging on Your Heartstrings (January at HMNS) – Nothing beats that Aww moment! Take an in-depth look at one powerful muscle, the heart. Includes sheep heart dissection. Leaping Lubbers (March at HMNS) – From tasty morsels to plague proportions, grasshoppers have long been a part of human history. Explore insect anatomy as you look at the Lubber grasshopper (Romalea). Includes grasshopper dissection.